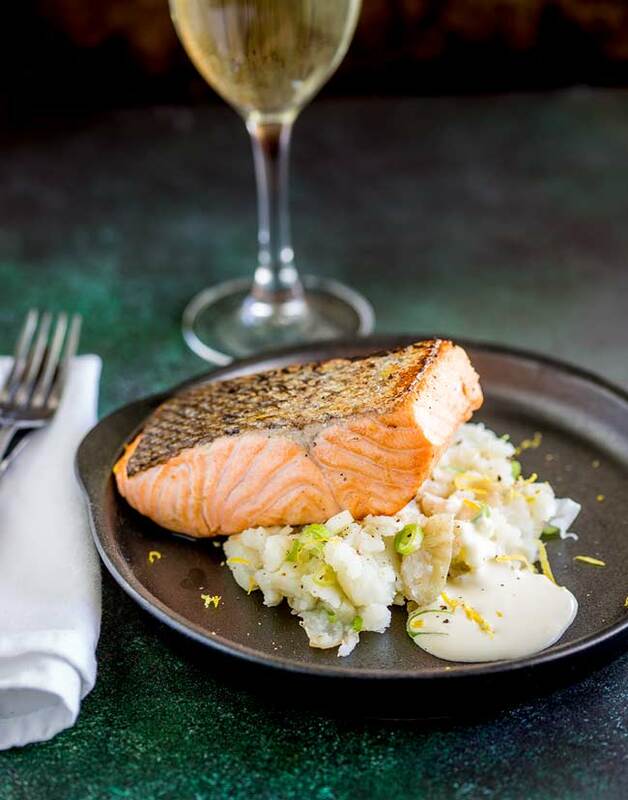 A juicy seared salmon fillet, sat on top of soft fluffy smashed potatoes, spiked with scallions and drizzled with horseradish cream. This Pan Seared Salmon with Creamy Smashed Potatoes is an elegant yet simple dinner party main course. Some people are worried about cooking fish for a dinner party, but the key to this dish is don’t overcook the salmon! A big juicy fillet like the one above needs about 5 minutes cooking time in a red hot pan. Any longer than that and the flesh will start to dry out and you’ll have a flaky dry fillet rather than a juicy succulent fillet. I like to leave the skin on the salmon, I think the crunch adds something to this dish and stops it being nursery school soft! Plus the skin helps to hold the salmon together and makes it easier to cook. To ensure the skin crisps up nicely, pat it dry with kitchen paper and then just before you put it in the pan give it a sprinkle of fine salt. Don’t add any pepper as this will burn in the heat of the pan. Then cook it skin side down for 3 minutes before flipping the salmon and cooking for 1 minute on the other side. If you look at the photo below the top edge of the salmon has been squared off. When you buy salmon fillets here you can a juicy fat end and then a very thin whiter end. When I am pan searing salmon I always cut that bit off, as it is so much thiner it overcooks very quickly. With the smashed potatoes I like to use dutch yellow potatoes, which are a small potato with a lovely creamy flesh. They are similar to jersey royals (which are impossible to buy here in WA!) Any potato will work here, but I would try and avoid the really waxy variety or the super fluffy mashing potatoes. The waxy ones don’t smash to a creamy consistency and the super fluffy ones will end up as mashed potato, and you do need some texture left. 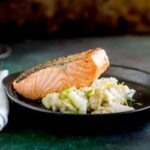 If you love this recipe for Pan Seared Salmon with Creamy Smashed Potatoes why not pin it for later. Place the potatoes in a saucepan, cover with cold water and bring to a boil. Cook for 10 minutes until just tender. Drain. Whilst the potatoes are cooking finely slice the onions. Mix the horseradish and cream together. Once drained, crush the potatoes with the back of a fork. Add the half of the horseradish cream and all of the spring onions to the crushed potatoes. Mix thoroughly and season with salt and white pepper. Cover the pan and set aside. They will keep warm whilst the salmon cooks. Use kitchen paper to pat the salmon fillets dry (especially the skin) and then season lightly with fine salt. Place a heavy based skillet over a high heat and let it get hot. Add the olive oil and then pan fry the salmon skin side down for 3 minutes. Flip and cook for a further minute. To serve, add a mound of smashed potatoes to each plate, drizzle with the remaining horseradish cream. Add the salmon skin side up and then grate over the zest of the lemon and sprinkle with sea salt. 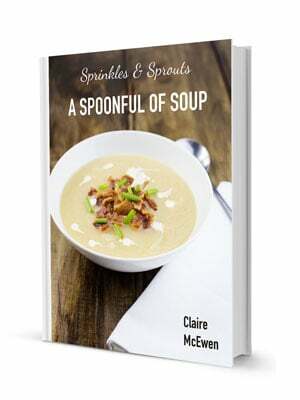 This recipe is loosely based around a delicious dish that I ate, many moons ago, at City Rhodes in London. I went there for a friends birthday and man I was in food heaven 😀 Sadly I think it might have closed now! There the salmon was confited in olive oil, so it was meltingly tender and butter soft. It was amazing, but confit salmon isn’t quite an easy entertaining recipe. So I had adapted it to home cooking. If you are serving this to kids, then you can easily leave out the horseradish, but you might need some extra salt. 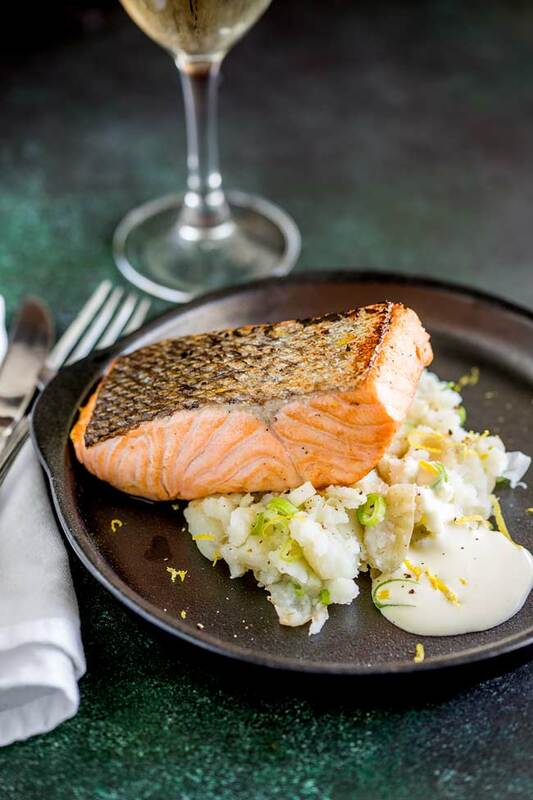 If you love food why not subscribe to my newsletter, I will drop you an email every now and then, just to say hi and send you a couple of recipes think you might love, like this Pan Seared Salmon with Creamy Smashed Potatoes. Salmon lover here and I also like to leave the skin for added crisp and taste! Nicely paired with mashed potato. I love how quick and easy this can be prepared. Perfect for any meal and any occasion. I’m a big salmon fan. Always looking out for different ways to cook and serve it. I’m so excited to give this recipe a try. Hard to beat Salmon and potato combination . It is such a wonderful fish isn’t it. I hope you get to give this a go. What a gorgeous plate. This is perfect for entertaining. Guests would be so impressed. 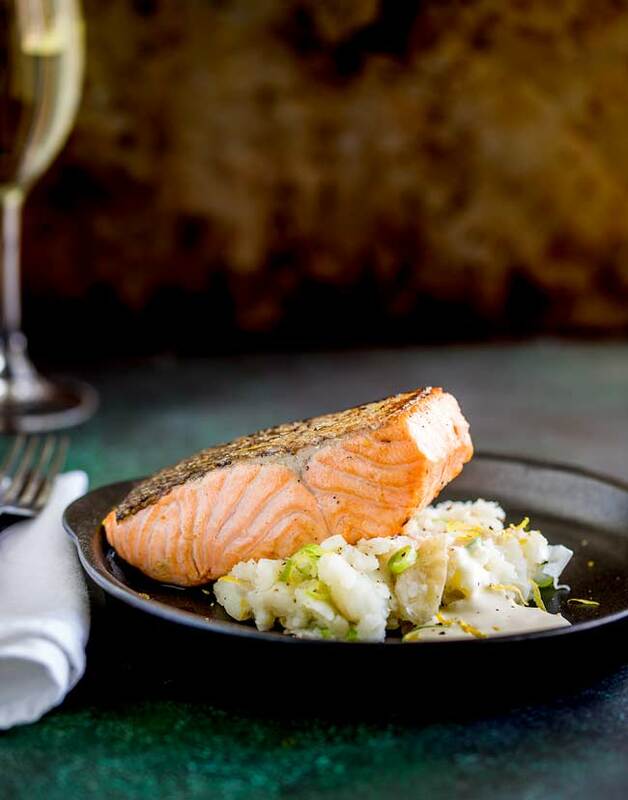 This sounds like a perfect meal, salmon is my favourite and that mash sounds so delicious! Those creamy smashed potatoes should anazing. We are potato obsessed, so always looking for new ways to eat them. but potatoes so often get a bad press and they are so versatile and delish. 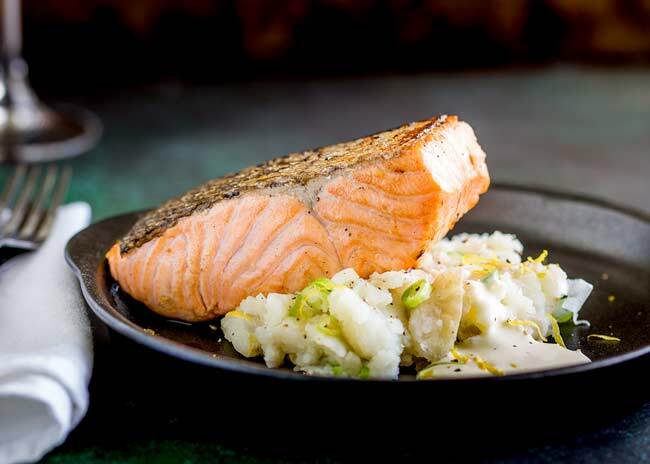 This is a delicious meal idea, the salmon goes perfectly with the potato. With the little added flavour from the horseradish, you really don’t need anything else. Great idea to cut off the thin end and use for a pasta dish.